I think I need a new camera. I spilled orange juice on it a couple of years ago, but I don't think that's why I get such blurry photos. My husband says I move the camera when I click the button. Maybe so. Anyway, I apologize for the slightly blurry photo of The Empty House. I'm not a photographer. Look at that cover. Doesn't it look like a flying car? Maybe something from a Hitchhiker's Guide to the Galaxy or Dr. Who? I'd been putting off reading The Empty House because I'm not much into science fiction, but Yvette at http://yvettecandraw.blogspot.com likes Michael and I like Yvette and most of the books and movies she recommends. 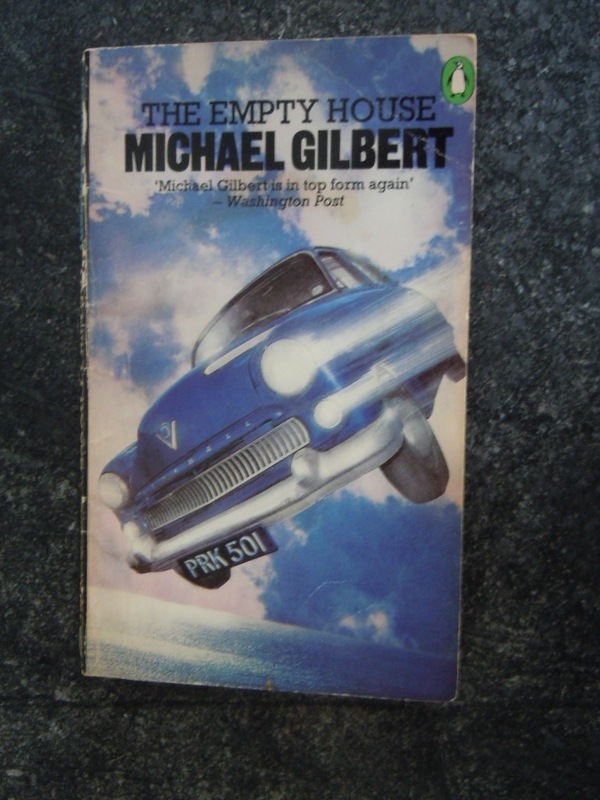 I started The Empty House on Saturday, was hooked after the first few pages (which also explained the flying car), and finished it on Sunday. I will definitely be looking for more Michael Gilbert mysteries. Peter Manciple, a young insurance adjuster, is sent to Devon to investigate the death of Dr. Wolfe, a scientist working on genetic research and bio weapons for the government. His car went straight off a cliff into the ocean (hence the flying car on the cover). Neither the car nor his body can be recovered from the dangerous area of the sea where it sank. By the way, there's a very funny couple of pages near the beginning of the book, when Peter goes to visit Dr. Wolfe's sister. She's got three dogs, and if you've ever had multiple pets, you'll be nodding your head and giggling from just before she answers the door until the door closes behind Peter. I can't tell you much more except that Peter realizes that he can trust almost no one. He becomes a target when people think he knows more than he does. He makes mistakes that get people killed or roughed up, but he comes to the right conclusion in the end. There's a nice twist, but I won't tell you what it is. Read it and enjoy it yourself. I hadn't been to The Book Trader for months. We thought we were moving, so I didn't want to get MORE books to move. But the move fell through when the seller changed his mind and begged us to release him from the contract. What could we do? It would be impossible to live in a house that had been reluctantly sold. Sometimes it doesn't pay to be nice - unless this means that a more perfect property is coming our way. 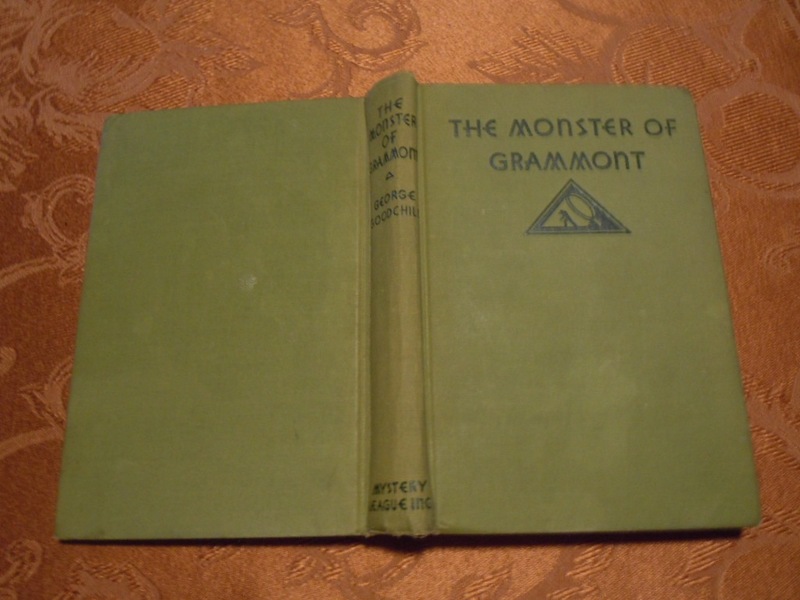 The story takes place around 1920. Julian Conrad and his young friend and business partner Ralph Wallace are touring France in Wallace's fast, new Bentley. Conrad, known as Connie, spies a castle he recognizes from a rest cure he'd been forced to take there during WWI. They happen on the owner, Monsieur Fallieres, and his daughter, Yolande. Wallace and Connie are invited to lunch. There are strange doings at the castle. 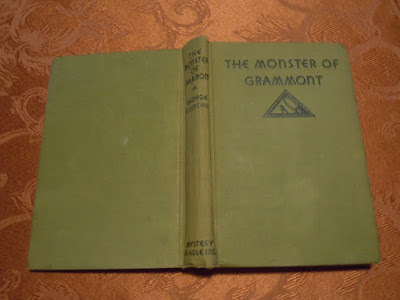 A huge monster in a monks' cloak haunts the place. It smashes mirrors and throws dirt indoors. It has also killed a servant. Wallace and Connie stay to help solve the mystery. There are more murders, Connie and Wallace are kidnapped, Yolande disappears. Other people are looking for something in the castle, aided by Bertha, a servant in the castle who seems to be too refined for a servant. Are they searching for treasure or something else? I liked this book. I learned some things about WWI and it eventually became a page turner. In addition to the kidnappings and searches for 'the monster', there were several car chases. Those races at 70, 80, 90 mph! were fun to read about. Wikipedia has very little to say about George Goodchild. He wrote about 200 books under several names. He wrote novels, mysteries, plays, non-fiction, and more. He was British, born in 1888 and died in 1969. And that's about it. It doesn't look like his works are in print. I see used copies from $3.50 to much higher prices. If you stumble on one of his books and it's not too dear, you might want to try it. I'll be keeping my eyes open. This was a $0.99 book from Amazon that I couldn't resist. 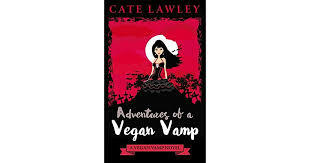 I'm a vegan, but not a vampire, so just the title intrigued me. Mallory Andrews, responsible and hard working, goes out for drinks with coworkers and wakes up very sick. A hangover? No, she's becoming a vampire. She doesn't know that until she finds a doctor who will see her quickly and who tells her she's a vampire. The doctor refers her to a group of people who will help her transition. There have been several other women similarly afflicted but who have died, really died. One of Mallory's problems is that now that she's a vampire, she can't stomach blood, meat, or dairy, literally can't stomach them. She finds that she can keep vegan nutritional supplements down. As she experiments with what she can and cannot eat, she discovers that she's become that strange creature: a vegan vampire. Alex, a charismatic wizard, helps her with the transition. He and some others also help her figure out which vampire bit her. They intend to mete out a suitable punishment: execution. This was a fairly quick and quite unusual read. I liked the characters and the novelty of the plot. There are several more in the series, so, if you're looking for something different, have at it. How's that for a creative title? I thought about calling this post 'D'you Lie (get it? D'you lie' 'July') About the Books You Read? ', but I thought that was a stretch. I can hear you groaning! A few of the mysteries were disappointing. I warned you that Love for Lydia was laid thick with an aura of disaster and pain. I liked The Chalk Pit, as I've enjoyed all of the books in that series. But, hands down, my favorite was Anne of Green Gables. I highly recommend it for anyone needing a does of humor, tenderness, and hope.